In spite of considerable human development, the southeastern United States region could provide some of the Western Hemisphere’s more heavily used thoroughfares for mammals, birds and amphibians on their way to cooler environments in a warming world, according to new research led by the University of Washington. 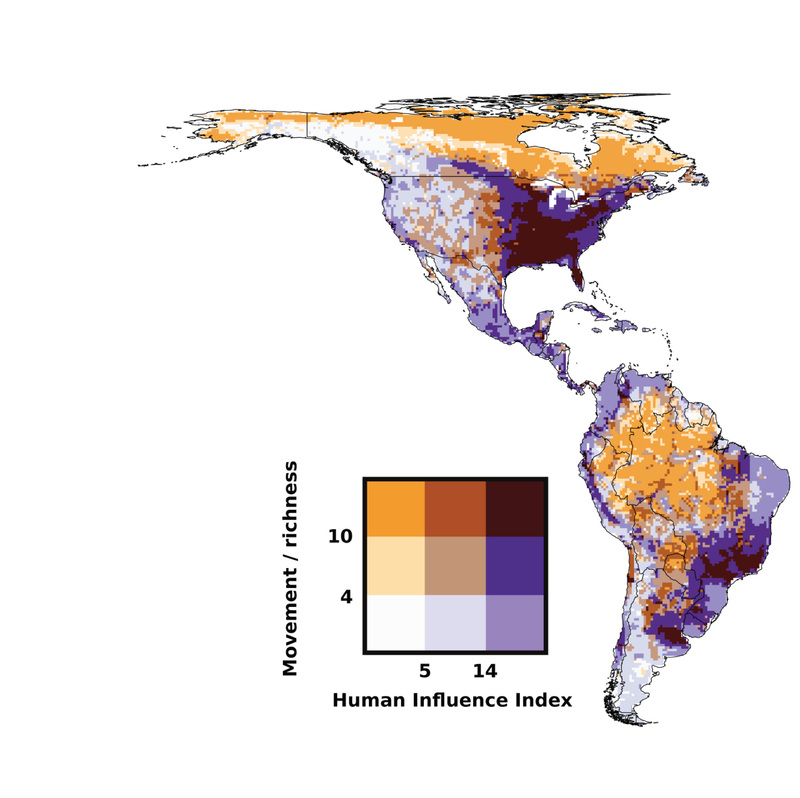 The region is among half a dozen areas that could experience heavier traffic compared with the average species-movement across the Western Hemisphere in response to a warming climate. The estimate in southeastern states, for example, is up to 2.5 times the average amount of movement across North and South America. Other areas that could see pronounced animal movements are northeastern North America, including around the Great Lakes and north into Canada; southeastern Brazil, home to both the species-rich Atlantic Forest and major cities such as Sao Paulo with its 11 million residents; and the Amazon Basin. The basin, stretching across seven South American countries, could have the greatest animal movements, up to 17 times the average across the hemisphere. The high northern latitudes also show pronounced species movements, not because of animals currently found there but because of an expected influx of species. While previous studies mapped where animals need to move to find climates that suit them, this is the first broad-scale study to also consider how animals might travel when confronted with cities, large agricultural areas and other human related barriers, according to Joshua Lawler, UW associate professor of environmental and forestry sciences and lead author of a paper appearing June 19 online in Ecology Letters. 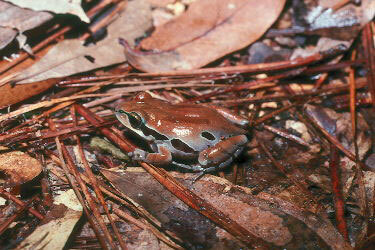 The golden mouse, ornate chorus frog and southern cricket frog – three of the species that will likely be on the move in southeastern U.S. – were among the nearly 3,000 mammals, birds and amphibians the scientists included in their study, nearly half of all such animals in the Western Hemisphere. Identifying where large numbers of species will need to move can help guide land use and conservation planning. Many of the animals moving southward through central Argentina will be funneled by agriculture and development through the more intact parts of the Gran Chaco region and into the Sierras de Córdoba and the Andes mountains. Similarly, the southern Appalachian Mountains in the southeastern U.S. are projected to act as a conduit for species moving northward in response to climate change. “These findings highlight the importance of the natural corridors that exist in these places – corridors that likely warrant more concerted conservation efforts to help species move in response to climate change,” Lawler said. In other places barriers may need to be breached for animals to disperse successfully. “Southeastern Brazil, for instance, has lots of species that need to move but is a heavily converted landscape. In such places conservation efforts may be needed to reconnect native habitats,” Lawler said. Except for one or two very localized studies, this is the first to project species movements based on both climate change and the constraints of human alterations to the landscape. For the climate component, the researchers took 10 projections of future climate, projected species movements for all 10, then averaged the results. 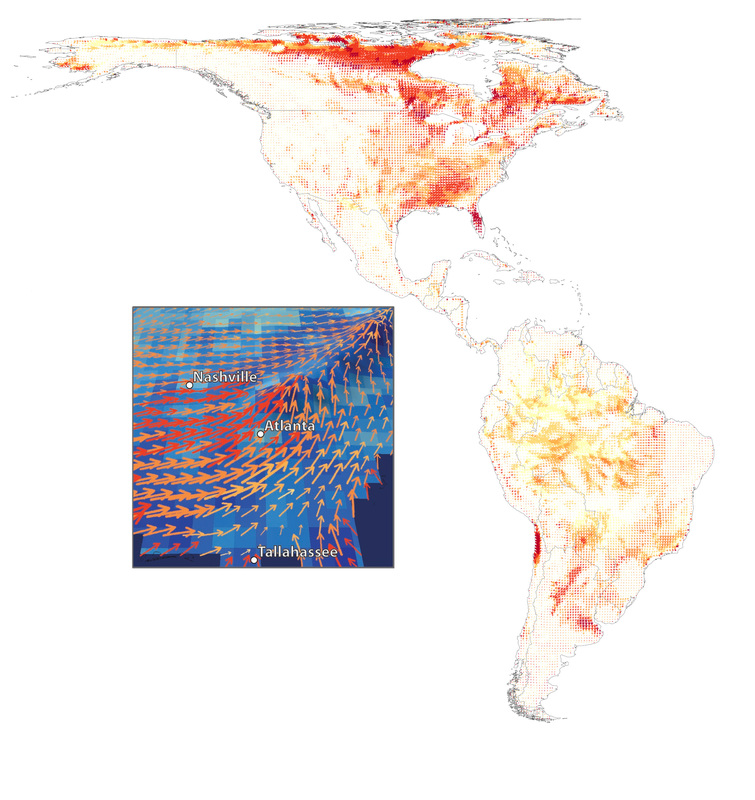 For the human impacts component, the scientists added cities, agriculture and other landscape barriers to 30-mile-square (50-kilometer-square) cells across the Western Hemisphere. They applied a technique developed by paper co-author Brad McRae of the Nature Conservancy that’s based on how electricity finds the path of least resistance when traveling across circuit boards. In this case, however, the “current” was the various species trying to stream through each cell, and the resistance was the human-made and natural landscape barriers. The work was supported by the U.S. Environmental Protection Agency and the Wilburforce Foundation. 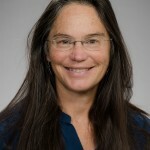 The other co-authors are Aaron Ruesch, who earned his master’s from the UW and is now with the Wisconsin Department of Natural Resources, and Julian Olden, a UW associate professor of aquatic and fishery sciences.